In Part 1 of this series we looked at how leaders generate meaningful environments where others can thrive. In Part 2 we explored a leader’s own quest for authenticity. In Part 3 we looked at the role of powerful conversations and a focus on relational ROI. In Part 4, we examined how meaningful leadership requires truth-seeking based on ethical values. In Part 5 we’ll take a look at how meaningful leadership makes a difference by building a better society for the future. Meaningful leadership sees the world in terms of building a better future together. The important focus on together requires not drawing lines around “better” or “worse” people or creating “in” and “out” groups. Meaningful leadership invests in building a better future together. That means making hard decisions today that will get us closer to a peaceful, safe society that works for everyone. In order to make this commitment, meaningful leadership requires being able to imagine such a future. Beyond imagining a better future, meaningful leadership requires actualizing it. That means making choices every day that show commitment to collective well-being on a global scale. If others carry on the work I have started into the future, what will be the net effect of my leadership in each of the areas of meaningful leadership below? How closely is my leadership aligned with building a better future together? What could I do to improve, starting today, in at least one area on that list? Leaders who solve complex problems need a special blend of qualities – the curiosity to untangle the variables, the persistence to keep trying, and the openness to change beliefs and strategies as answers emerge from the chaos. But those qualities will only take them so far. They’ll also need to be great listeners and engaging leaders, so that they gather information from stakeholders and team members. They’ll need to be systems thinkers with a global mindset. Even if leaders usually demonstrate those important qualities, when problems seem too complex to solve they may be tempted to use ineffective approaches to gain a sense of control. Facing increasing complexity, they may revert to negative patterns instead of adapting to change. I think we’ve probably all done this when we’re stressed – as leaders or even as parents – becoming more inflexible and demanding that things go a certain way. What happens when leaders fail to notice that they are “taking control” instead of influencing and engaging? They de-motivate teams of highly talented people trying to stay on the cutting edge of an industry. That de-motivation can lead to a spiraling decline in important organizational metrics. While it may provide the illusion of control, controlling or top-down leadership doesn’t invite organic information sharing or encourage rapid adaptation. Both are needed for survival in today’s evolving global marketplace. Want to Learn More? Join Leading in Context CEO Linda Fisher Thornton Thursday, November 9 for Developing Leadership That Inspires, a Live Online Workshop via Compliance IQ. Great leaders use meaningful connections, shared values and mutual understanding to bring people together. Their decisions and chosen paths are mutually beneficial for multiple constituents. They understand leadership as a process of bringing out the individual and collective best in others for the long-term good. Trust is no longer considered a “nice to have” element in the effective workplace. It is a “must have” element that energizes the whole organization. Working in a safe high-trust environment, people can do extraordinary things. On Monday I received a Trust Across America 2017 Top Thought Leaders in Trust award an d a Lifetime Achievement Award. 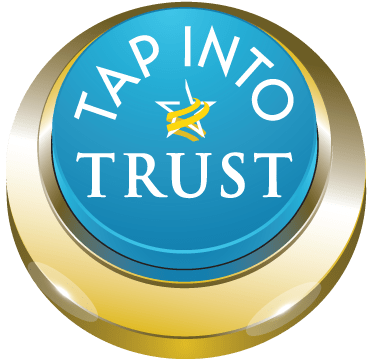 It is quite an honor to be recognized along with so many notable champions for trust. Beinhocker, Davis & Mendoca, 10 Trends You Have to Watch, HBR.org. I like the term “trust-rich” because it describes the ability of trust to transform every corner of a business or organization. It also describes the positive financial impact that results from consistent trustworthy leadership. We can disagree calmly in ways that help us solve problems together, or we can show our stripes by using aggressive behavior under the banner of “with all due respect.” Whichever approach we use, how we interpret respect impacts the people around us. There is no place for disrespectful behavior in a “good” society. Even if we agree on that point, respect can be understood from a variety of angles. You may already be thinking of a leader who operated in the red zone (in the graphic above), creating a toxic environment that caused emotional harm. Real respect is not one dimensional. You may have also encountered people operating in the yellow zone who were carefully polite but did not go out of their way to help others or demonstrate care. Real respect is not selective. It’s not selfish. How we choose to offer respect to others is an ethical issue. A narrow view – for example, “I will respect whoever I choose to respect and no one else” can lead to negative interpersonal behavior, which increases tension, conflict and stress. Leaders with a SELFish understanding of respect may look for opportunities to BENEFIT THEMSELVES by using respect selectively. Leaders with an OTHERish understanding of respect might look for opportunities to BE FAIR AND EQUAL in respecting others, not showing favoritism to certain groups, but showing respect for all. Respect at the highest level incorporates positive intent and impact. Leaders with a high level OTHERish understanding of respect (that incorporates care for others) will go beyond using polite behavior to look for opportunities to help and be in service to others. They will tend to stay in the green zone, where they don’t just “not offend people,” they have an intentional positive impact on others. I think of the “respect” in the yellow zone as only the minimum standard for interpersonal behavior. Don’t great leaders give so much more?